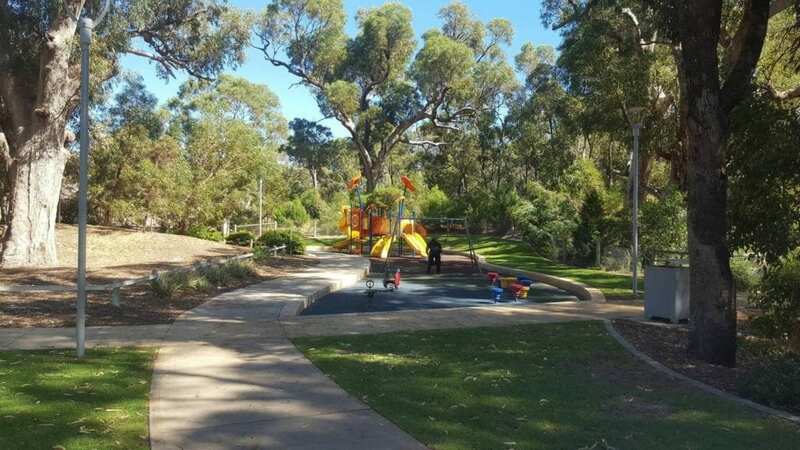 Just outside of Mandurah, tucked away in suburbia is Meadow Springs Quarry Adventure Park. 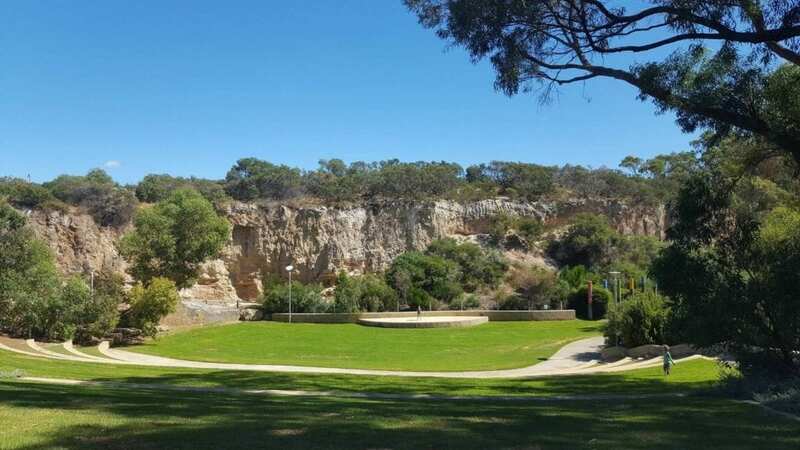 Its size is deceiving from the road, with a lush green grassed area and playground visible, however, it extends back and down into the quarry. 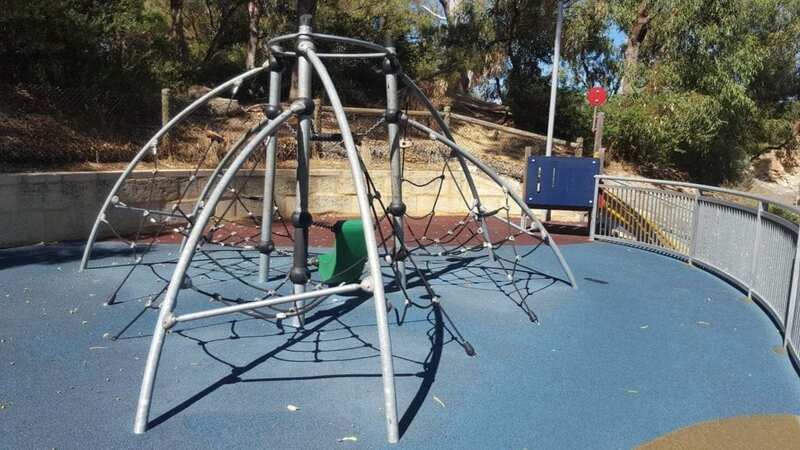 The first playground you come across is a traditional style one, with a lovely big spider net swing, fun stepping stones, slides, stairs, climbing challenges and some rockers. Hiding under one of the climbing walls were even some dinosaurs to be found. This playground is perfect for younger children, my toddler had an absolute ball here. If you walk further back from this playground, you come around a bend and find another huge playground, perfect for older children. 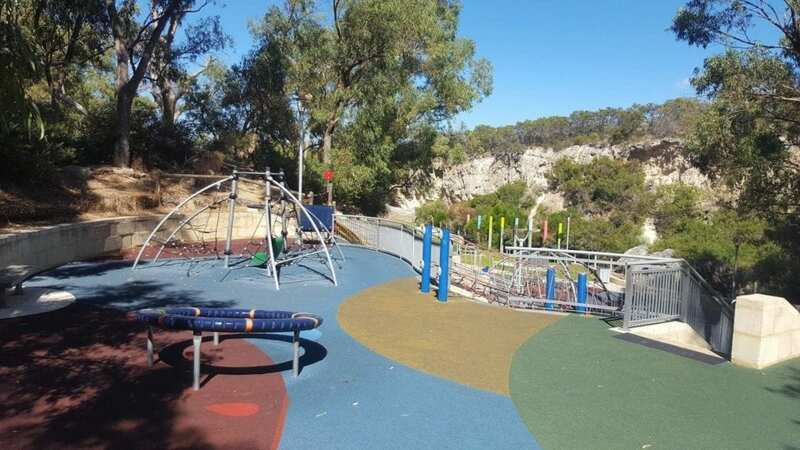 There are huge climbing spider web nets, a massive and steep slide, and other pieces of play equipment set all the way down the side of the quarry. 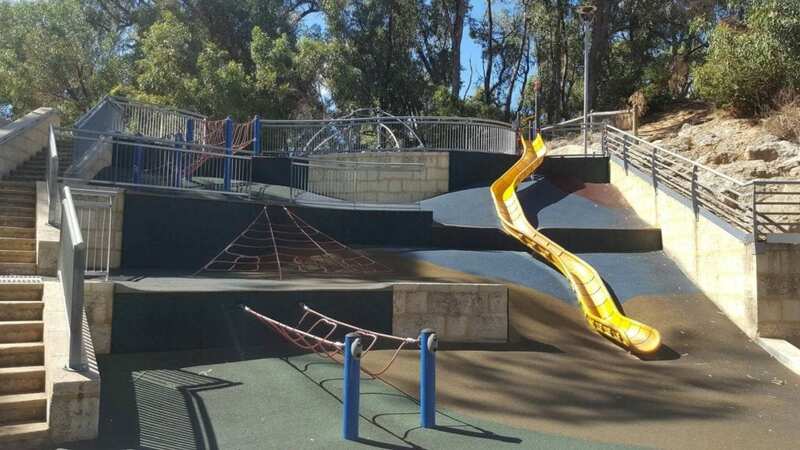 If you have children who love to climb, or love a challenge they will just love this park. All the equipment is set on soft fall rubber. 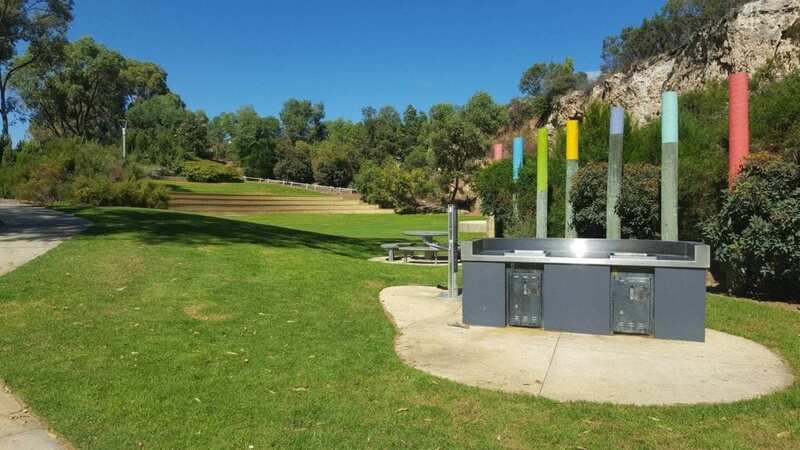 Off to the side, past some bushland is the amphitheatre, this area is grassed and offers a whole lot of fun for children. There were kids playing on the stage and calling to each other all the way back to top level of seating, other children enjoying climbing up the tiers and rolling balls down. 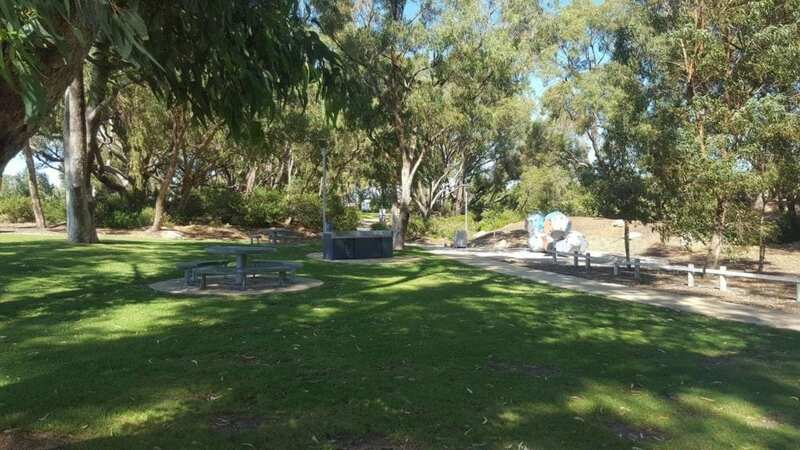 The top park area has BBQs, toilets and water fountain along with a few picnic benches. There are so many trees that this area is very shady, and the one play area is partly shaded by the trees. The play area set down the quarry however doesn’t have much shade. This park has something for every age group (there were even a few things that the adults all wanted to try! ), though keep in mind, you can’t see both play areas at the same time. Whether you live locally or are travelling down south, I can recommend a visit to this Meadow Springs Quarry Adventure Park! A whole lot of fun for children of all ages and will certainly tire out any little climbing monkeys you have! The park used be as mentioned, now it is deteriorating. 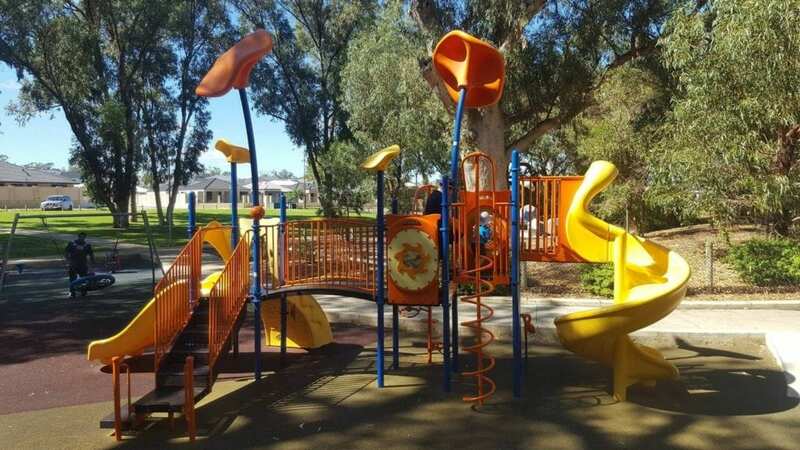 The play equipment also gets very hot quickly so limited play time is available. 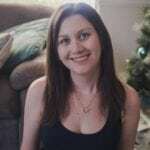 My kids love it there, but needs improvement.